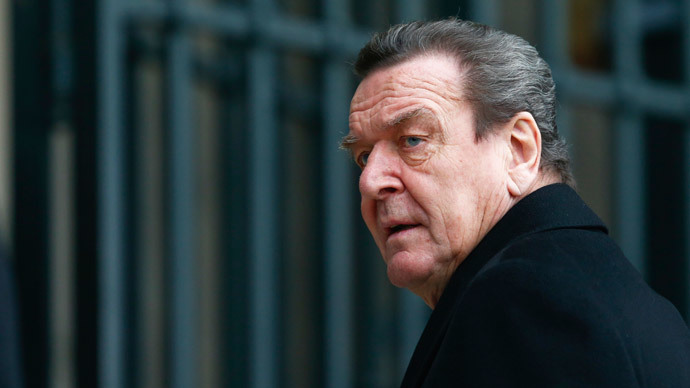 German ex-Chancellor Gerhard Schroeder has slammed Angela Merkel’s policy towards Russia, saying he understands Moscow’s foreign policy concerns and sees no reason to fear a possible Russian threat in Eastern Europe. Schroeder, the chancellor of Germany from 1998-2005, fully recognized Russia's concerns, which are linked to the growing isolation of the country. “The Warsaw Pact ceased to exist with the end of the Soviet Union, while NATO not only survived, but also has extensively expanded to the East,” he said in a Saturday interview to Der Spiegel. Schroeder said he knows “no one, not even in Russia, who would be so mad as to just consider placing in question the territorial integrity of Poland or the Baltic states,” he said, seeking to lessen the fears of Russia’s Eastern European neighbors. Schroeder also mentioned the German government's policy on Greece, calling it “too little European, and too German.” The country is one of Greece’s creditors, and Merkel has urged Athens to commit to implementing structural reforms in order to repay bailout money. On Thursday, the German parliament approved the EU's association agreement with Ukraine, as well as with two other former Soviet Union states, Moldova and Georgia. It means a “new level of cooperation,” according to German Foreign Minister Frank-Walter Steinmeier, as all three countries will be preparing for future European Union membership. At the beginning of March, the head of the Russian Ministry of Economic Development and Trade, Alexey Ulyukaev, said that Moscow still had concerns about the economic impact of the EU's association agreement with Ukraine.